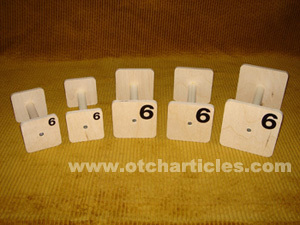 A set of scent articles includes 6 of each material (wood, leather, metal), numbered from 1 to 6, needed to compete in Obedience trials in Canada. 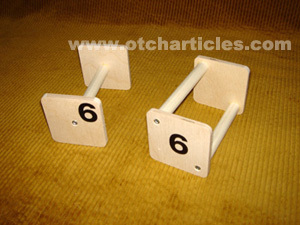 Articles are available in single or double dowels. 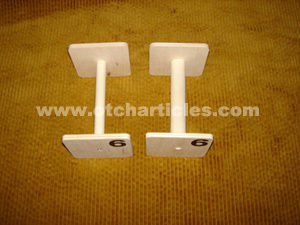 Dowels are available in 1/2" or 3/4" diameter. 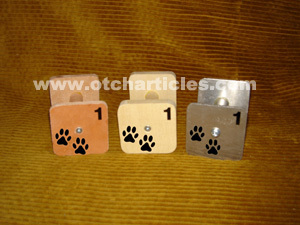 Each scent article sets are custom made as we get the orders so that they are made according to each dog's needs. 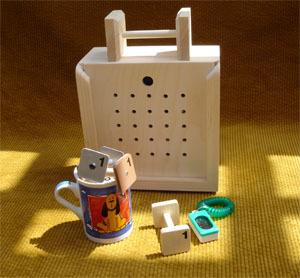 Because of the variety of sizes available we can not list them all on this website. More than 20 years of experience has thought us, though, that some sizes will fit most dogs. 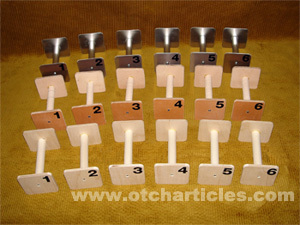 *Scent articles can be made with 3/4" diameter dowels also. Add 10$CAD to prices above. We are not limited to the sizes above. and we will adjust the price accordingly. You do not know the size of the scent articles for your dog? Visit our information page to help you find out. Please specify your choice when ordering scent articles. Your scent articles can be personalized with vinyl decals. Go to our Decals page for details.